Paper by Mallarie Stevens. Viewed on Netflix and Amazon Instant Video. More often than not, Hollywood films come with an un-prescribed dose of escapism. Tales of love, adventure, crime, drama, friendship, tragedy, comedy, and a host of other themes come neatly packaged in carefully contrived and dutifully edited sequences. These sequences are intended to lure the audience into the narrative – to create a world that is perhaps recognizable, but altogether separate from the real one outside. All films, both within and beyond the confines of Hollywood, carry with them the message(s) intended by their directors, screenwriters, and producers, but few do so with the characteristic style of Austrian filmmaker Michael Haneke. Far from Classic Hollywood conventions, Haneke’s Code Inconnu: Incomplete Tales of Several Journeys (2000) carries an almost documentary like sense of realism portrayed by (sometimes excessively) long takes shot in real time. While it does not fit comfortably into any particular genre, Haneke’s work is perhaps most easily typified as experimental film. Disjointed in its storytelling and ambiguous in its message, Code Inconnu follows four parallel storylines, each independent of and disconnected from the others. Further characteristic of Haneke, the audience is confronted with the subtleties of modern day social injustice in the film’s nine minute, unedited, tracking-shot filmed introductory scene. Set on a busy Paris sidewalk, this scene brings all four main characters together in real time for their first and only meeting of the film, simultaneously drawing the audience in to their lives and tasking us with the burden of interpreting and critiquing the elusive meanings behind their actions. From the white text of the credits on a black screen, the film moves to a pair of doors in a beige brick building, one of which hastily opens to reveal lead character Anne Laurent (Juliette Binoche) rushing out into the Paris sidewalk. As Anne walks, we hear a voice calling to her from behind. She pauses and turns to greet Jean (Alexandre Hamidi), her boyfriend Georges’ younger brother. Jean would have gone up to Anne’s apartment (from which she just emerged), but he doesn’t know the code. He tried to call her, but there was no answer. Anne is in a hurry, so the two walk together, as Jean asks where Georges is (he’s gone to Kosovo for his job as a war photographer, we learn) and informs Anne that he’s left their father’s farm. Suggesting to Jean that he “must be hungry,” Anne ducks into a small bakery while Jean wanders slowly into a nearby alley. Now eating a pastry herself, Anne catches up with Jean and hands him a small paper bag with another pastry inside. They return to their conversation about the farm and Anne advises Jean to listen to his father. With a not-at-all subtle warning that it’s “not big enough for three,” Anne gives Jean the code and key to her apartment and they depart in opposite directions. In addition to revealing Anne and Jean’s relationship in this first half of Code Inconnu’s introductory scene, Haneke has already alerted us to his primary stylistic devices for communicating theme and meaning in the narrative: the long take and the tracking shot (Barsam and Monahan, 252-78). Observing the speed at which the camera matches Anne’s pace and her movements through the lively Paris street, we know that Anne is in a hurry before she makes any comment about it. We are also very much aware of the public space with the constant shuffling of people and the sounds of the city in the background – cars driving, honking, people walking, side conversations, etc. There is a voyeuristic quality which comes with Haneke’s unvarying shot distance. A stable medium shot keeps a consistent depth of field, limiting our perspective of the surrounding area and instead focusing us on the characters. With real time tracking and alterations of pace to keep up with the Jean or Anne or both, the sense is that we are following them, without their knowledge. Walking back in the direction from which they just came, Jean stops for a moment to listen to a street performer in the alley by the bakery. As he continues walking, Jean crumples up his pastry bag and throws it into the lap of a beggar woman, Maria (Luminita Gheorghiu), who is sitting at the corner of the alley. Before he can get very far, Jean is stopped by a young black man named Amadou (Ona Lu Yenke), who confronts him about this rude act. Jean attempts to brush Amadou off several times, but Amadou is persistent and a scuffle follows, attracting the attention of the musician’s audience, a nearby shop owner (Jean-Yves Chatelais), several police officers (Marc Duret and Laurent Suire), and Anne, who rushes back into the scene. One of the officers runs after Maria, who has left the scene, and brings her back to the group (now in front of the flower shop), where another officer is taking the statement of the shop owner and telling Amadou that he must come to the station. We later learn that Amadou is beaten and generally mistreated by the police while Maria is deported to her native Romania. It is no coincidence here that the converging of a diverse range of characters, many of whom are in conflict with one another, takes place in front of a veritable wall of flowers in a rainbow of colors. As all of the characters introduced thus far gather in one haphazard semicircle, into which we peer over the framing shoulder of a police officer on one side of the shot and Maria’s shoulder on the other. Together with the characters, we listen to the instructions of the officer who seems to have taken charge of the situation – the ultimate authority. As such, the decision is made to take the immigrant and the black man to jail while all others are free to go. This is a significant commentary on Haneke’s view of the institutionalization of racism in Western society, or at least contemporary French society. Haneke’s challenge to us is clear: “in a public place, he put the thinking, questioning spectator in the excruciatingly uncomfortable shoes of someone confronting brutality and injustice in a situation where it would be easy – or perhaps not so easy – not to intervene. The film takes a critical look at the ethnic heterogeneity of contemporary French life through separate characters and their interlocking stories” (Cardullo, 263). The scene abruptly concludes here, on an image of Amadou struggling with two officers who are attempting to restrain him. This struggle is a sharp contrast with the peaceful backdrop of rows of flowers. Red, orange, blue, yellow, purple, white, and green fill the screen, unwittingly placed together like the diverse range of characters that they represent. The overlapping themes of race relations and social division (and Haneke’s critique thereof) as well as the decisions of the characters to intervene in violent or overtly offensive acts, or not, are continually re-addressed throughout the film. These concepts each originate on the busy Paris sidewalk and Haneke continues to link them, unedited and uncut, via his long takes shot in real time, “emphasized by the blackouts that abruptly cut off and separate their [each character’s] scenes” (Grossvogel, 40). A short while later in the film, for example, we see Anne engaged in the monotonous rhythm of ironing clothes. Her stare is blank, as she passively watches the television while ironing and folding one shirt and then another. Her passivity continues, however, as she hears the screams of a child, mutes the television, and pauses. Her expression turns to one of concern as she waits and listens. Moments later, the screams have stopped and she returns first to ironing and then to the television. Here, Haneke’s camera is unwavering, unmoving, and, seemingly, unattended. Intruding on Anne in her home, watching her amidst an uninteresting chore, we are again voyeurs, tasked only with judging Anne’s actions (or lack of actions, in this case). Haneke’s continued use of the strategically positioned – and then ignored – camera in conjunction with the long take serves to re-emphasize his commitment to realism, as established in the introductory scene. Strangely reminiscent of a security camera, Haneke’s stationary camera appears again as we eavesdrop on Anne with Georges (Thierry Neuvic) and a group of friends in a restaurant, Amadou and his companion in the same restaurant (shot within the same long take), and Maria as she rides in a friend’s van, all of which occurs within a five-minute segment of the film which, of course, is less total time than the entirety of the single introductory scene. The scene in the restaurant is further significant as a second point at which two of the (unrelated) characters are brought together. This scene begins with a still camera capturing Anne’s group as they laugh and chat at a table, but the camera moves to follow Amadou as he walks through the shot, then settles again on another still shot of Amadou and his date at their table. It again follows Anne back to her table as she walks through the restaurant and it settles back down on the same view of the group of friends. Movement of the camera here is essential to the narrative, but it is indicative of neither visual excitement nor technological virtuosity. Rather, camera movement follows character movement and a moving camera often indicates some connection between the characters – a chance passing of Amadou and Anne, for example. Notably, Anne’s view of Amadou remains distinctly negative. She points him out to Georges as “the black kid who hassled Jean” before the scene ends, again abruptly. In Haneke’s own words, “Code Inconnu was shot entirely in long takes. This was an exception [among Haneke films], because the focus itself was on fragmentation” (Grundmann, 12). Though it’s clear that Haneke is providing a sense of realism with the long take, his work is also experimental and the use of fragmentation serves several purposes. First, it calls attention to the disconnect between the characters. We are meant to recognize their interconnectedness, of course, which is demonstrated in the highly impactful introductory scene, but the rest of the film continuously reminds us that they are separate and encounters between them are by chance (in the restaurant scene, for example), as their lives would not normally be intertwined. This is re-iterated later in the film when Anne herself is harassed by a pair of Arab boys on the Metro. Again, there is a racial stigma presented, as the boys who do the harassing are part of a minority. However, as in the first scene, again it is a minority (this time, another man on the Metro) who stands up for the person being victimized. In an odd, yet subtle, twist, Anne is placed into the position of the beggar woman from the beginning of the film – harassed in a public space, a male minority comes to her aid. Fragmentation also serves the purpose of alerting us to unconventional editing practices. With only a handful of exceptions, which purposefully and quite deliberately highlight a change in the film’s perspective, the only editing is from scene-to-scene rather than shot-to-shot. Accordingly, smooth transitions are virtually nonexistent, with each scene ending abruptly, as previously noted. There is no sense of closure, but rather a feeling of disorientation and even randomness. In this context, despite portraying unedited realism, Haneke calls our attention back to the fact that this is indeed a film, denying us the opportunity to become fully engrossed in any sort of narrative continuity. Carefully emphasizing this point, the only scene in which Haneke fully embraces conventional editing practices is one that is not actually a scene from Code Inconnu, but rather a scene from a film in which Anne is a featured actress. Flooded with a bright, natural light that is not to be found anywhere else in Code Inconnu, the scene portrays Anne, as her character, in a swimming pool joyfully professing her love for her male counterpart until the two realize their son is in danger of falling from the tall building. Here, frequent cuts, which speed up as the two become hyper-aware of the danger to their son, allow each of the three actors’ perspectives to be represented, in the context of the film within the film, while the rest of the Code Inconnu’s realism is again emphasized. Ultimately, the ambiguous and unconventional style of Code Inconnu leaves it open to various interpretations. Haneke, however, is often cited for his concern with philosophical understandings of morality, particularly in terms of racial, political, and social matters, and Code Inconnu is no exception. Accordingly, Haneke focuses on “an exterior portrait of the consequences and effects of characters’ decisions and actions; inference takes the place of explicit descriptions; and, most importantly, intellectual and moral development, rather than being celebrated, is identified through negative, even diabolical, examples” (Grundmann, 8). At the end of the film, we return to the scene where it all began. Maria has returned to Paris despite her humiliation at having to beg and her subsequent deportation. She walks past the alley, the bakery, and, of course, the wall of flowers where the characters all originally converged. Anne has changed her door code again – it remains unknown. True to the film’s subtitle as well (Incomplete Tales of Several Journeys), the characters’ stories remain incomplete, but there is no question about the significance of the introductory scene on the Paris sidewalk near Anne’s apartment. The interplay of the characters there lays the foundation for the entirety of the film as well as establishing the cinematic devices that will remain consistent throughout the film. In his use of the long take and overt, even awkward, transitions from one scene to the next, Haneke reminds his audience that real life cannot be edited. He includes each monotonous and mundane detail, successfully avoiding any illusion of escapism in a film where an uncomfortable sense of voyeurism all but guarantees the intellectual engagement of the viewer. In turn, we wonder, what are the consequences of our actions? What are the consequences for the characters? But Haneke does not answer us. Barsam, Richard and Monahan, Dave. Looking at Movies. 4th ed. New York: W. W. Norton and Company, Inc., 2013. Print. Cardullo, Bert. European Directors and Their Films: Essays on Cinema. Lanham, Maryland: Scarecrow Press, Inc., 2012. Print. Code Inconnu: Incomplete Tales of Several Journeys. Dir. Michael Haneke. Perf. 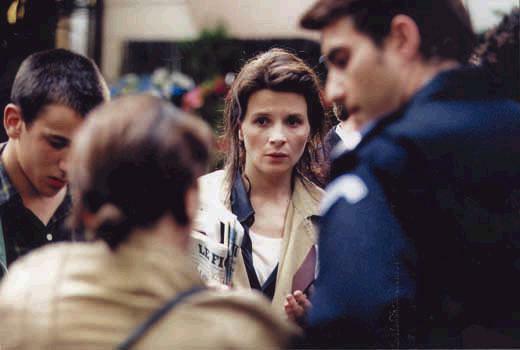 Julie Binoche. Bavaria Film, 2000. Netflix. Grossvogel, D. I. “Haneke: The Coercing of Vision”. Film Quarterly. Vol. 60 No. 4. (2007): 36-43. JSTOR. Grundmann, Roy. “Unsentimental Education: An Interview with Michael Haneke”. Cineaste. Vol. 35 Issue 1. (2009): 8-13. Academic Search Complete. I really enjoyed reading the piece you wrote on Code Inconnu. I thought that this was very well written and I really got a lot out of reading this piece on the film. What I really liked about the piece was that you went into great detail about part of the film. I liked how you did not just write a summary but really went into detail about aspects and different part of film. Overall I thought that this piece was very well written and you did a great job with it. Thank you for your very involved review. I enjoyed the way you gave a very descriptive introduction in the type of film and various mystiques regarding the film. The term “experimental film” is one I have yet to hear and your description of this film leads me to believe I would enjoy the genre. I have not seen this movie, let alone, heard of it, but it has definitely caught my intrigue. The way you describe the camera work setting the audience up as voyeurs was a great way to describe the process of watching someone in a private setting with an unmoving camera. These types of film styles seem very awkward or difficult to film. I actually enjoyed reading this after coming home after a long day and instead of finding my eyes reading but my brain not following along I found myself very interested in the piece you wrote. I’ve never heard of the film, but your vivid description of it makes intrigues me. I enjoyed how you offered personal insight while analyzing and reviewing the experimental film. One of the better reviews I’ve read on the site in my opinion. Thanks for the read! Awesome review! I mainly chose to read this one in particular because it was a title that I was unfamiliar with. You captivated me off that bat due to the fact that your explanation and description was clever and to the point without spoiling any aspect of the movie. I respect when a writer can offer their opinion without being biased. You described the movie for what it is while allowing me to understand the style of the movie and spark my interest as this in not the type of film I would typically choose to watch myself. I love when you said “Disjointed in it’s story telling and ambiguous in it’s message”. This sentence really provoked my curiosity in the broken storyline itself. Your review has created a curiosity for this film with the details and suggestive descriptions you have provided. Thank You!